Because Death and Taxes! : Tax Law Permanence? No Chance! Tax Law Permanence? No Chance! Recently, well just three months ago, Washington presented us with a brand new tax code called the Taxpayer Relief Act of 2012 or TRA.. This new law changed our income, estate and gift tax systems entirely. One of the features of this new tax law was supposed to be it's permanence. Well, the tax law is permanent no longer. The TRA of 2012 brought new tax rates and exemptions. It was designed to create permanence and certainty to allow you to plan your financial affairs and estate without having to redo everything from year to year. This is now going up in smoke (the whole tax law looks like smoke and mirrors anyway) with the President's new budget proposal. 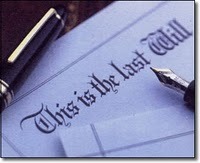 Reduction in exemptions used in estate planning to 2009 levels. Increase in tax rates for estate and gift taxes to the highest levels, 55%. Extreme restrictions on the use of IRA's and similar savings tools. Elimination of the ability to stretch inherited IRA payments over the lifetime of a beneficiary other than the surviving spouse. While the budget proposal would do many, many more things to our tax code, this short list should be enough to alarm everyone what may be coming. Please remember to not shoot the messenger and consider writing your Congressional representatives to express your feelings about the proposed changes. Also remember, if the budget proposal passes, it will be time again to review your planning and make appropriate changes. Please let me know if you have questions about these changes and how they impact you. Also, please join in our conversation and post a comment here or to me via email about this or any of our estate planning topics. The Pace of Change: Embrace It!